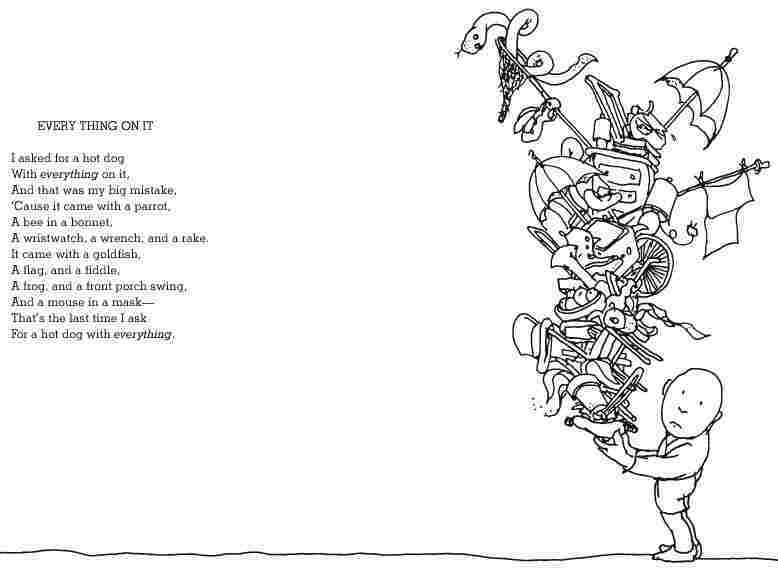 Shel Silverstein's Poems Live On In 'Every Thing' The family of the beloved children's poet has released Every Thing On It, a collection of playful, previously unpublished poems and drawings. "I cannot see your face," Silverstein wrote in a poem to his young readers, but in "some far-off place" he assures them, "I hear you laughing — and I smile." 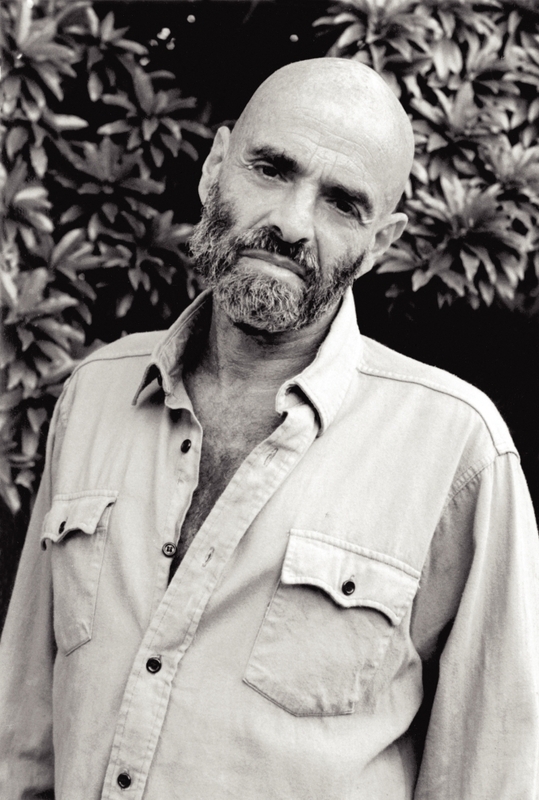 When Shel Silverstein wrote the poem "Years From Now," he seemed to know that one day he'd be gone but that his playful words and images would still be making children happy. "I cannot see your face," he writes to his young readers, but in "some far-off place," he assures them, "I hear you laughing — and I smile." 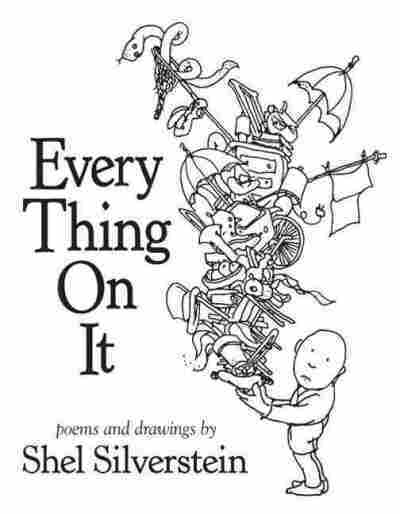 Every Thing On It includes 145 poems in all. Silverstein eliminated many of them from his earlier books, not because he didn't like them, but because they just didn't happen to fit in the perfect order he was looking for in a given collection. Toni Markiet, editor of the new collection, worked on other projects alongside Silverstein. Markiet says the poet paid close attention to every last detail. "He would move a piece of art over an 18th of an inch ... and look at how it looked on a page," she tells NPR's David Greene. " ... It's a slight adjustment, but to him, it mattered. I think one of the reasons his books are still so immensely popular after almost 50 years is that every tiny detail was considered." To stay true to Silverstein's aesthetic, Markiet worked closely with the poet's family and used previous books as a template for the balance and pacing of the poetry and illustrations. The right-hand side of every page had to entice young readers to turn to the next page. The poetry needed to be arranged carefully to create a mix of funny, poignant and naughty. "I think he liked to mix it up," Markiet says, "so that a child or any reader would never be bored. You could let it open at any page and you would be entertained." 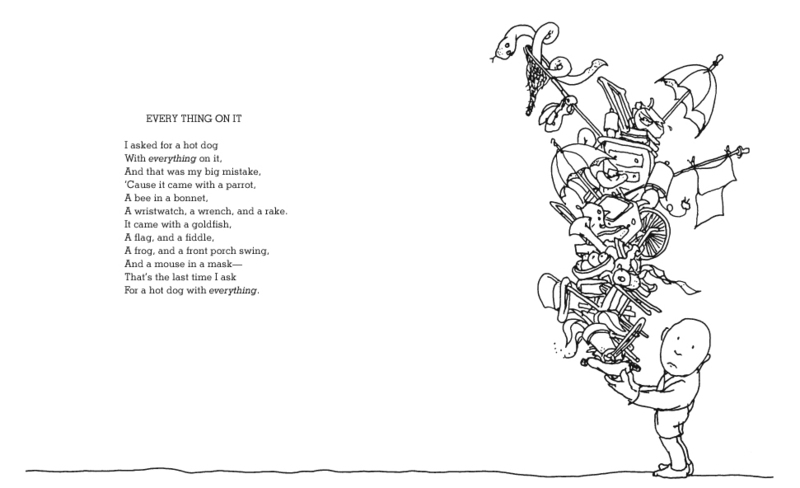 "Every Thing On It" was chosen as the book's titular poem in part because of the lively art that accompanied it. A boy — who has asked for a hot dog with "everything on it" — holds a bun piled sky high with a basketball hoop, a snake, a hat, an umbrella, you name it. "If you look at [Silverstein's] other books, the title was part of the artwork," Markiet explains. "To him, typography and layout was part of the whole. The art is wonderful. I mean, you look at it and you wonder: What is he doing with all that stuff on a hot dog? It makes you want to turn [the page.]" 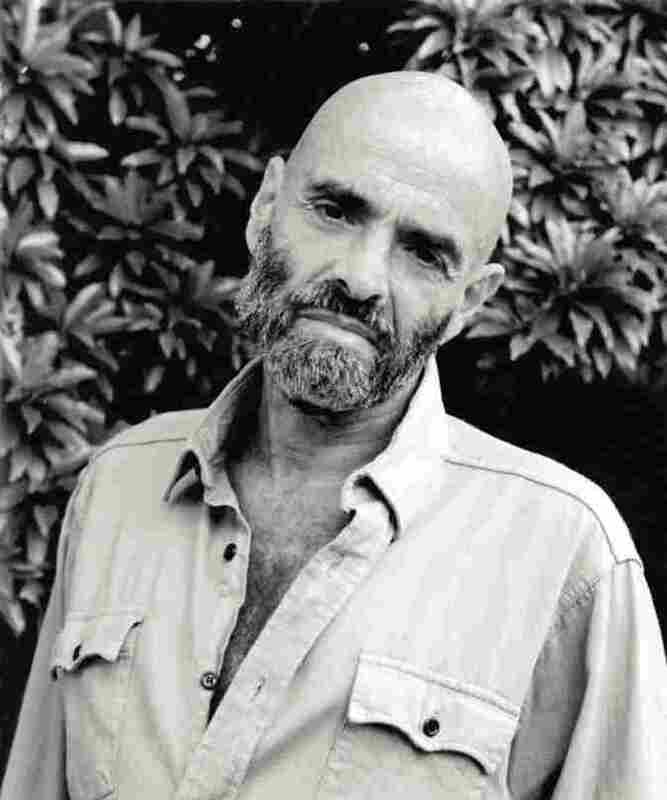 Shel Silverstein, author of Where the Sidewalk Ends and The Giving Tree, died at age 68 in 1999. There were more than 1,500 poems to choose from, says Mitch Myers, Silverstein's nephew. 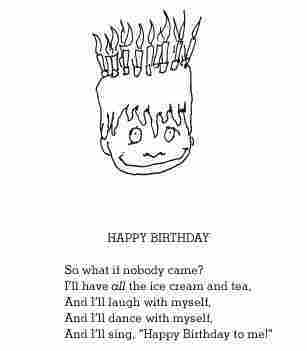 To whittle the collection down to just 145, a small team of Silverstein's family members got together once a month for about a year to read the poet's verses aloud. They shared their favorites, and separated the maybes, the nos and the keepers. "We believe ... that poems need to be read out loud," Myers says. "This is one of the joys of the book, and we really were able to determine if it really worked when we said it out loud." The collection was carefully pieced together, as the family sought to do justice to a poet and illustrator who was sensitively attuned to pacing, balance, humor and timing. "These are his poems, this is his art," says Markiet. "We didn't do anything to them. We simply chose them out of the ones that had not had a chance to be published yet." Oops--I think I split my jeani.